After a long hiatus of foreign rule, Chhatrapati Shivaji Maharaj had managed to carve out a Hindu kingdom in an Islamic India. Those were troubled times. The foreign rulers always displayed religious arrogance towards their hindu subjects. Justice was never even and lawlessness was rampant. Even their royal courts produced rival factions, with the Irani (Persian) / Turani (Central Asian) stock getting precedence over the indigeneous Hindustani. Their hindu fief holders were more interested in retaining their estates and turned a blind eye to the fanaticism of their masters. Hence there was a general discontent amongst the populace albeit muted. However, people secretly desired a liberator. That was when Chatrapati Shivaji maharaj arrived on the scene. Such was the personal charisma and persuasiveness of the king, that his every follower identified with his cause and joined him in large numbers. He gave them a hope to cling on to and a dream to cherish. He promised them a land they could call their own. A land free of oppression and religious bigotry, a land where justice prevailed, a land where people were heard and had their say . Ofcourse it was to be a monarchy but a very benevolent monarchy. Eventually, it took Shivaji almost three decades to translate his dream into reality. His kingdom was duly named ‘swarajya’ or self rule. Though popularly known as Hindavi swarajya, it wasn’t just a swarajya for the hindus but a swarajya for all those who considered themselves to be the sons of the soil (sons of hind - hindustan) . According to the historian Sir Jadunath Sarkar, Shivajis greatness lay not in his creation of a kingdom, but in the circumstances in which he created it (..... from the survey of the conditions amidst which he rose to sovegreignty). Shivajis swarajya was accomplished amidst extreme adversities. This was something nobody had envisaged. After decades of enslavement, the most fierce of warriors had turned benign and resigned to their fate of subservience . This remained the case until the advent of Shivaji. He stirred them up from their slumber and ignited in them the spark of freedom. After almost three and a half centuries of a foreign rule (of the Afghans , the Mughals or the Sultans of Persian descent), finally the people had a king who had risen from their own stock. To achieve his goal Shivaji had to tackle not one but two formidable empires. The Adilshahi Sultanate of the south and the mighty Mughal Badshahi of the north (not to mention irritations from the Europeans). It was no mean achievement by Shivaji. He was tremendously constrained in terms of resources and manpower. But nevertheless he succeeded in his quest by sheer grit, a brilliant acumen , a daring approach and an endurance of spirit. As the adage goes, that luck favours the brave, mother destiny too showered her gracious fortune on this entrepreneurial son of hers. Shivajis courage was rewarded with some early successes and his ambitions soared new heights. But one of Shivajis great qualities was, while his head always looked up to the sky, his feet were always firmly entrenched on the ground. Shivaji was undoubtedly a very courageous person, but his courage was never impaired by recklessness but rather embellished by caution. Like a seasoned general, he knew exactly when to attack and when to retreat. He was extremely circumspect while fighting the enemy . He did so with extreme cunning , a knowledge of not just his own strengths and weaknesses but also that of his enemy. Something which he acquired through his resourceful spy network. Hence more than often the place and time of his battles were his own choosing , something which gave him an distinct edge over the enemy. Thus, Shivaji always proved to be a step ahead of his rivals. Starting as a teenaged leader of a band of young Mavales (inhabitants of the Maval region around Pune), Shivaji was quick to comprehend the geographical intricacies of Sahyadri terrain . He used these mountains virtually as his armour while battling some very daunting foes. Lightening in his movements he swept down on his unsuspecting enemy and before the latter could react, disappeared into the darkness of the night or back into the thickly vegetated camouflage of the hills. Thus the enemy despite the colossal size of their armies and their great wealth, soon found themselves helpless against the brilliance of Shivajis strategems. Shivaji practised the Kautilya neeti of Chanakya, whereby the end was more important than the means. Afterall his enemy was powerful and crafty and it was more often necessary for Shivaji to match deceit with cunning. He never made any pretentions of chivalry or magnanimity towards the enemy , (which history repeatedly shows has led many a great warrior to their peril) and crushed his enemies with ruthlessness. Thus, even the veteran generals like the Goliathic Afzal Khan and powerful Shaista Khan found it difficult to match Shivaji in terms of guile and they soon found themselves at their wits end. Shivaji was a born leader of men . He inspired loyalty in his soldiers to such an extent that many a gallant knight like Tanaji Malusare, Baji Prabhu Deshpande, Prataprao Gujar, Baji Pasalkar ….. readily sacrificed themselves at the altar whenever the need so arose. In fact no era ever witnessed such a regularity of martyrdom as during Shivajis time. Though it is true that Shivaji was a devout Hindu who fought enemies many of whom were incidently Islamic by faith, it will be factually incorrect to label Shivaji as a Hindu zealot or anti Muslim. On the contrary, his secular credentials were always impeccable. He regularly prayed at Muslim dargahs and sought blessings from Sufi peers like Baba Yakut. Muslims were free to practice their religion in his kingdom without any hinderance. Shivaji was even magnanimous in allowing the tomb of his arch foe , Afzal Khan to be built at the site where he was killed. Never did Shivaji ever raze down a mosque in victory nor allowed anyone to desecrate the holy Koran during his raids. He disallowed defilement of womenfolk even from the enemy camp. He had issued strict warnings to his men to refrain from such acts and meted out the strictest punishment to those found guilty of breaking these cardinal rules. This fact has been acknowledged even by the mughal chronicler Khafi Khan, one of Shivajis severest critics. Moreover, Shivaji freely employed muslims in his army at various positions . There are examples of them reaching high positions viz. Noor Beg, Haider Ali Kohari, Daulat Khan,Ibrahim Khan …just to name a few.But at the same time Shivaji never hesitated to take up cudgels for his hindu bretheren. His bold letter chastising mughal emperor Aurangzeb for the oppression of the hindus is quite well known. Hence, It wasn’t a war between Hindus and the Muslims as such, but more of a war between the aborigine and the oppressive invader. Shivaji began his quest with a small heridatory fief, but increased it ten fold by capturing a large region that stretched from ghats bordering Pune to coastal plains of the Konkan. Hence it became all the more imperartive that the Marathas declare their own king to rule this vast land. Eventually a pandit from Kashi by the name of Gaga Bhat suggested that the Rajyabhishek of Shivaji take place and Shivaji be crowned the king of kings , the Chhatrapati. The coronation ceremony was thus conducted on 6th June, 1674, on the fort Raigad amidst great pomp and splendor. The English envoy Henry Oxinden who witnessed the ceremony writes, ‘… This day, the Raja, according to the hindu custom was weighed in gold and poised about sixteen pagodas which money together with one hundred thousand more, is to be distributed after his coronation onto the Brahmins who in great number are flocked hither from all the adjacent countries…’. The Jedhe Chronicle mentions ‘…on 30th May 1674, Shivaji was invested with the holy thread and he married again according to the Vedic mantras’. Records also mention the presence of the heir apparent Sambhaji with Shivajis queens, his mother Jijabai amongst the many royal attendees, dignitaries and soldiers. There were several elephants and horses present on the fort as observed by Oxinden. Note: The throne was designed by one Ramaji Datto Chitre of Kolhapur. Shivajis court at the time of his coronation has been described as - Shivaji arrived in the court (wearing gold toda around the suruwar around the legs, jewellery around the neck a kavda necklace-over the angarkhaa, kambarpatta,...),with his right hand weilding a golden bow and his left hand held a golden Vishnu idol (the king symbolises the incarnation of Vishnu on earth). The ashta pradhans (Moropant Pingale held a gold kalash with perforations,Hambirao Mohite held a silver kalash, etc) flanked the throne.On the right side stood Balaji Avji Chitnis and on the left side stood Nilopant Farasvis. Madari Mehtar (who was given the title Takht Firosh, caretaker of the throne). One sardar Vishwasrao Gaekwad held Bhavani the bejewelled sword of the king. The men around the throne weilded the royal sceptres-insignias (gold chavri, morchel,gold spear with a weighing scale symbolising even justice and fair commerce,gold spear with fish head symbolising control over seas,gold spears with horse head symbolising a powerful cavalry). Gagabhat held the royal umbrella over the king......... - Shivcharitrakathan by Shivshaahir Babasaheb Purandare. Shivaji struck his own coins and inaugurated a new era called Rajyashaka. Also the fort Raigad was declared the new capital of the kingdom. A blueprint on the proposed administration of the kingdom was drawn out. It was executed by Ranganath Pandit and was called the Rajyavyavaharkosh. But a tragedy struck Shivaji, when he lost his mother Jijabai hardly within a months time after the coronation. Shivaji considered it a bad omen and re conducted the coronation ceremony this time as per tantric traditions. The ceremony was conducted by one Nischalpuri Gosavi. This ceremony was however a very simple affair and lasted just for a day. Shivaji didn’t rest on his laurels and conducted several successful incursions in the south (northern Karnataka and Ginjee in Tamil Nadu) which brought him more territory , wealth and glory. Shivaji could have achieved much more if the jaws of death hadn’t snatched his eventful life. Shivaji fell ill and breathed his last on 3rd April 1680, almost six years after his coronation. He was just 53. Shivaji left behind a legacy. A legacy which empowered the future generations of the Marathas , providing them with a self belief that propelled them to rise as major force in the political scene of a greater India. The Marathas by their valour, ferocity and martial skills, have traditionally been a warrior force to reckon with. In the 18th century, they created a large empire encompassing a major part of Deccan and central India (besides strong influence in regions of northern and eastern India). The marathas relied mainly on their infantry and cavalry during war. The mountainous terrain of the Sahyadris made the Marathas a strong, nimble footed and athletic lot. The terrain also made them use light weaponary especially during the gureilla type of war that they fought. This enabled them to make quick movements and swift strikes on unsuspecting enemies and then disappear into the darkness of the night or the shield of the thickly vegetated mountains during the day, (before the enemy could gather their wits).Ofcourse, with increase in their military power, their gureilla style often made way for the open pitch style of warfare. It also brought in a certain amount of sophistication in their weaponary. 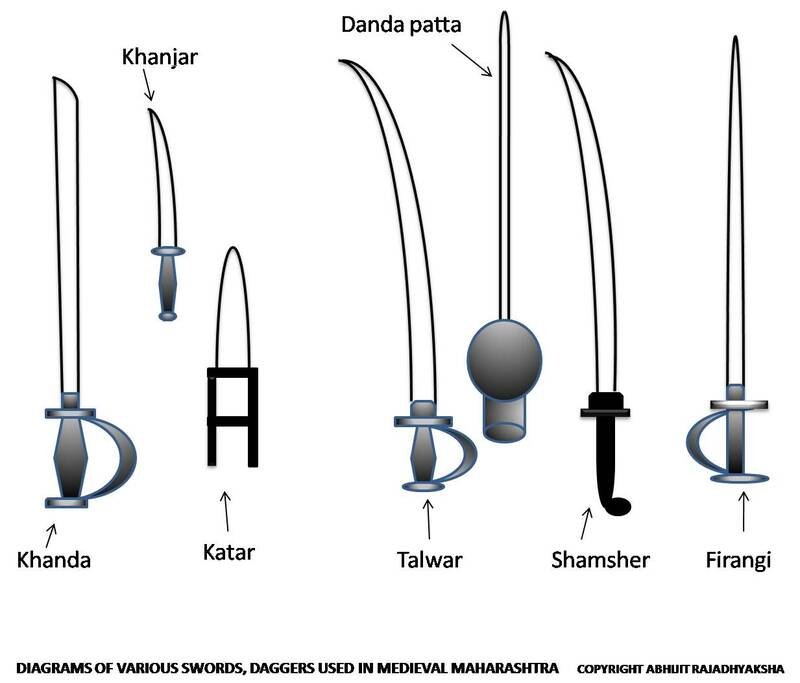 Some of the medieval weapons traditionally used by the Marathas were the variants of swords like the talwaar, the firangi, the khandaa, the paataa ,and the variety of daggers like the kataar, the shamsher,the jaambiya . 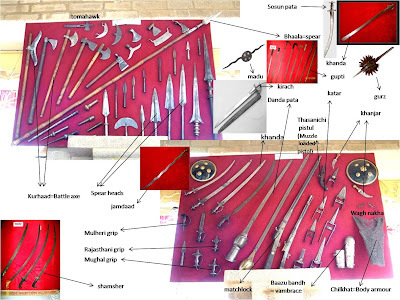 Also prevalent were the ancient bhaalaa (spear), dhanushya baan (bow and arrows), kurhaad( battle axe), parshu (axe variant), gadaa / gurz (mace) or unique weapons like the waagh nakh (tiger claws). 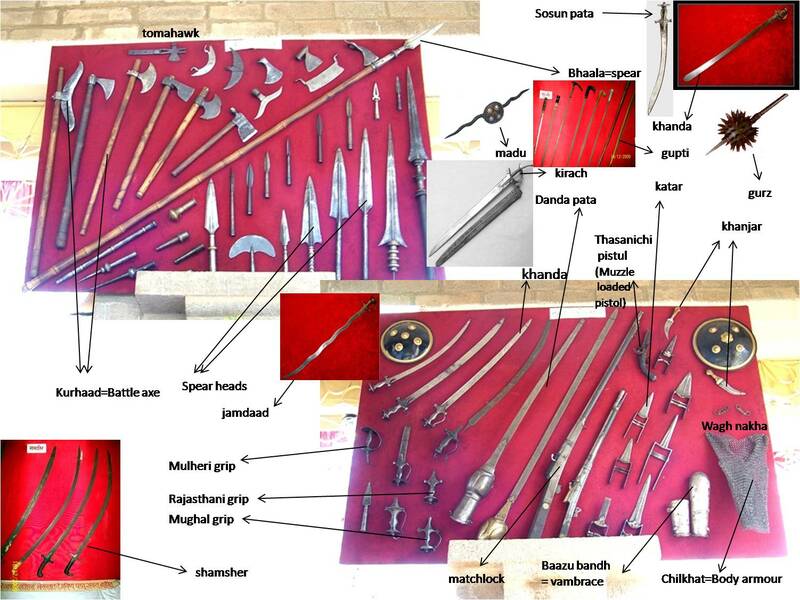 These weapons were made as per the quintessential designs borrowed from the Rajputs, the Mughals,the Persians,the Afghans and the Europeans. But were often modified to suit the Maratha style of martial art. Talwar is an Indian sword, with a curved blade, with the hilt covered by the enclosed flange, which extends from the guard to the pommel. It is often double edged and having a pointed tip. The talwar was used by both the infantry as well as the cavalry because of its effective draw cut. The handle of the talwar often displayed intricate engravings. Firangi is an sword with a long straight heavy blade like its European counterpart and a pointed tip. It has a full sharp edge on one side and the other side has around six inch sharp edge.It was used by the cavalry.The hilt has a knuckle guard (basket hilt). Shivajis famous 'Bhavani ' & 'Jagdamba' talwar were styled in this fashion. Kirach is an sword similar to the firangi, except that the blade is broad, single edged and comparatively short and having a basket hilt. Shamsher is a sword in its Persian form. 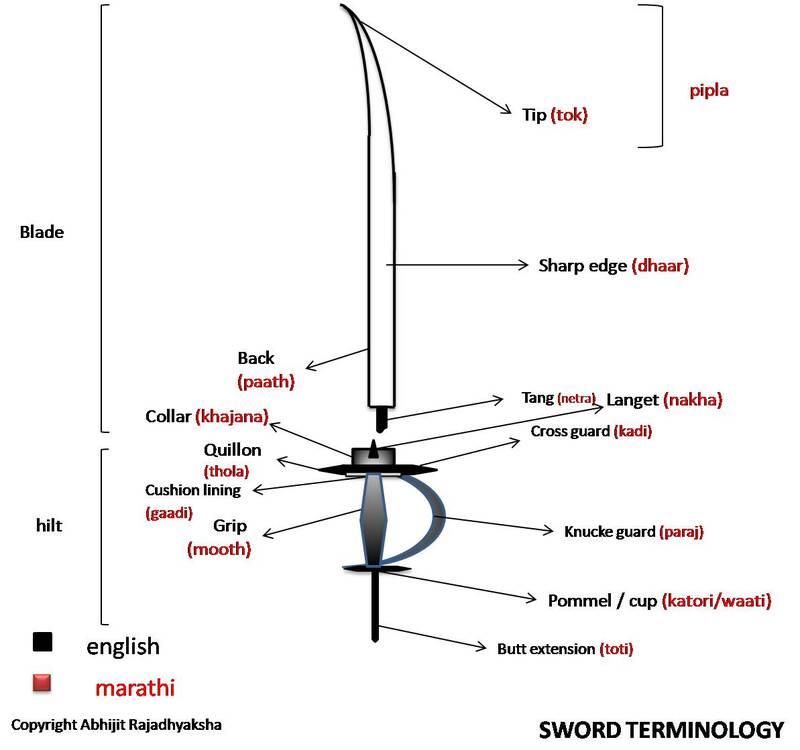 The blade is generally curved (but also straight and double edged) like the talwar but less wide. It has a slash cut operation. There is no pommel and the hilt continues in a curve. 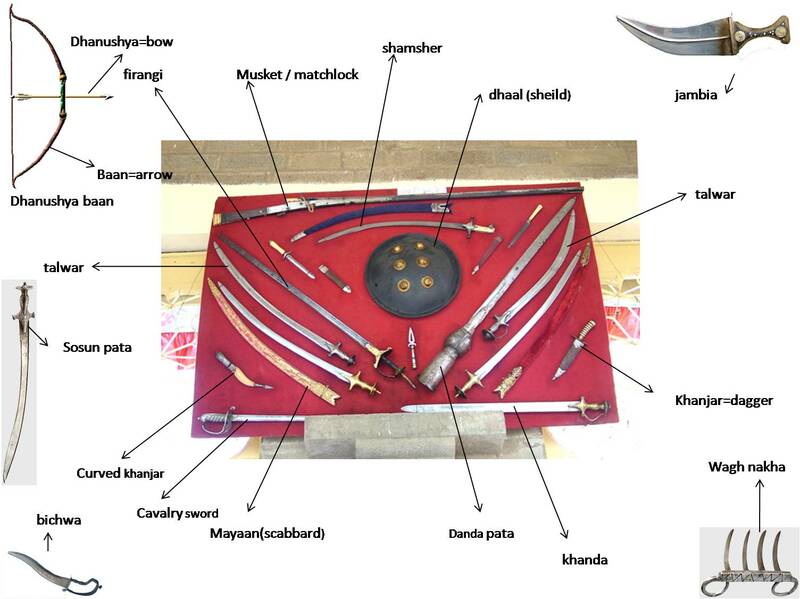 Khanda is a sword used in hacking operations. It has a wide blade that broadens in length and is double edged with a flange connecting the guard to the pommel and covering the hilt.The tip of the blade is not distinctly pointed. Sosun Pata was a serated recurved blade with a pommel and a knuckle guard. Danda Pata is a sword that gets integrated in a gauntlet. The blade is often long and flexible (varchi) and tied as a belt and whisked out when wanting to be used. Its long blade was fiercely waved in a circular eliptical motion to keep away the attacking enemy. It was said to have been famously used by Baji Prabhu Deshpande to ward off the Siddis army, giving his master Chatrapati Shivaji enough time to escape the fort. Adilshahai general Afzal Khans bodyguard Syed Banda was said to be a expert with this weapon. Jamdaad (literally means Yamachi daadi or beard of Yama, the lord of death n the underworld) is a double edged snake like wavy sword. It was one of the swords gifted by Mughal commander Diler Khan to Shivaji during course of negotiations.It was also carried by Afzal Khan when he went to meet Shivaji at Pratapgad. 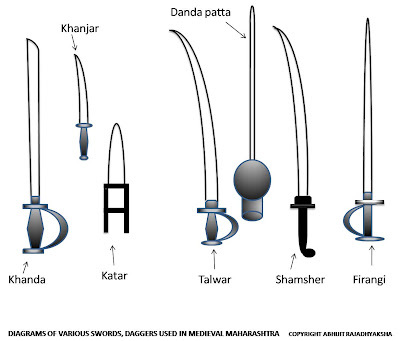 Khanjar is a dagger originating in the Arabian regions, which found its way to India. The blade is short and double edged. It is carried in a engraved sheath. Kataar is a type of a short punching dagger with a horizontal ‘H’ shaped handle.Used when the enemy is close.It often opened displaying two more blades. Katyar is a dagger with a curved blade to first stab and twisted around for maximu damage. Guptis were poined swords with straight blades concealed in a scabbard resembling wooden stick . Bhaala is the marathi term for a spear. It was a wooden shaft with a sharp mettallic head.It was used both by the infantry as well as the cavalry. The cavalryman used to throw the spear at the enemy and then followed it up by whisking out the sword. Kurhaad is the marathi term for a battle axe. It has a lunar shaped sharp edged small metal toolhead mounted on a wooden shaft.Its variant was the ' parshu' an axe with a sharp broad semi lunar shaped blade and pointed curved hook at the other end (the curveed hook wasnt present on the kurhad. Gurz is a mace like iron club with spikes used to strike on a enemy wearing a helmet and armour. Madu was a shield with a handle and two pointed antelope horns protruding from both sides. 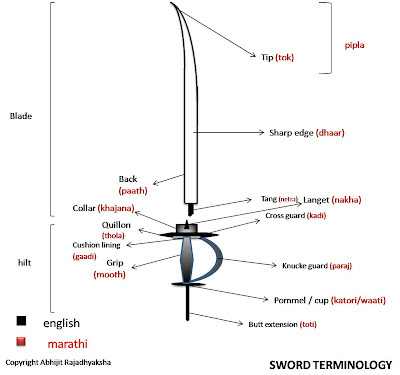 Bichwa is a doubly curved doubly edged S shaped bladed dagger with a looped hilt. Jambia is a short dagger that originated in Yemen having a curved steel blade. The hilt was often called a saifani hilt and was made of rhinocerous horns. The sheath was made of wood. Dhanushya Baan is the term for a bow and arrow. The bow is a flexible wooden arc with a strong string tying its both ends. It propels a arrow that acts as a projectile hitting a target. Waagh nakha was made famous by Ch.Shivaji maharaj when he used it to disembowel the mighty Afzal Khan. It acts as a ring like weapon that fits around the knuckles. It remains concealed when the palm is closed but when the palm opens it reveals barring out sharp edged pointed claws made of steel that can tear apart the human body. – Aadnyaapatra by Ramchandra pant Amatya, the chief minister of Rani Tarabai. Translation – Forts are the very basis of a kingdom. 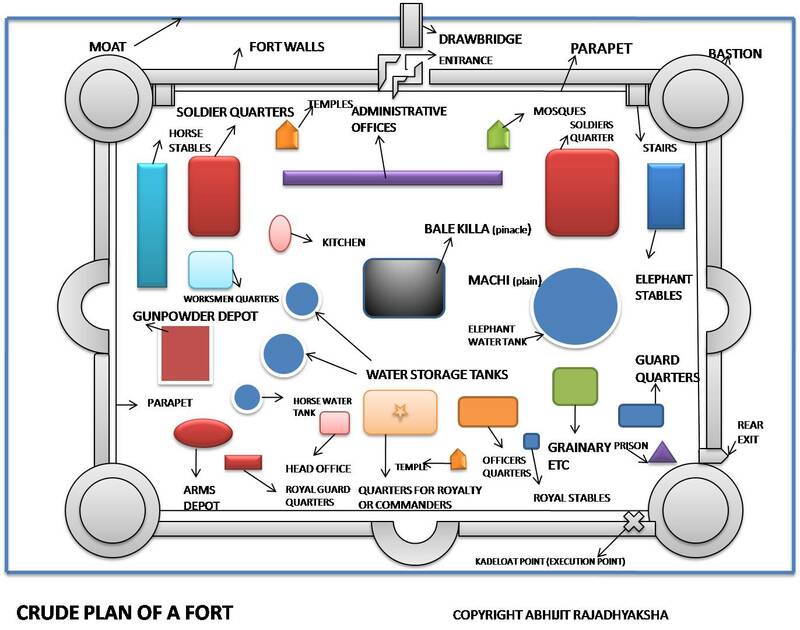 Forts themselves are the kingdom, forts are the origin of the kingdom, forts are the real treasure of the kingdom, forts are the basis of an army, forts are the wealth of the kingdom, forts are our best form of defence. The English word Fort is derived from the Latin word 'fortis' meaning strong. 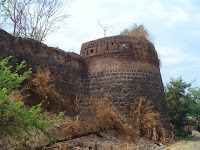 Forts were a primary defence mechanism in Maharashtra against enemy invasions since the ancient times and are known in the local language as ‘killa’ (Qila in urdu). They were naturally and artificially protected human settlements, guarded by elements like the hills, the forests, the desert, the sea, and the man made stone structures that formed a armour around them. 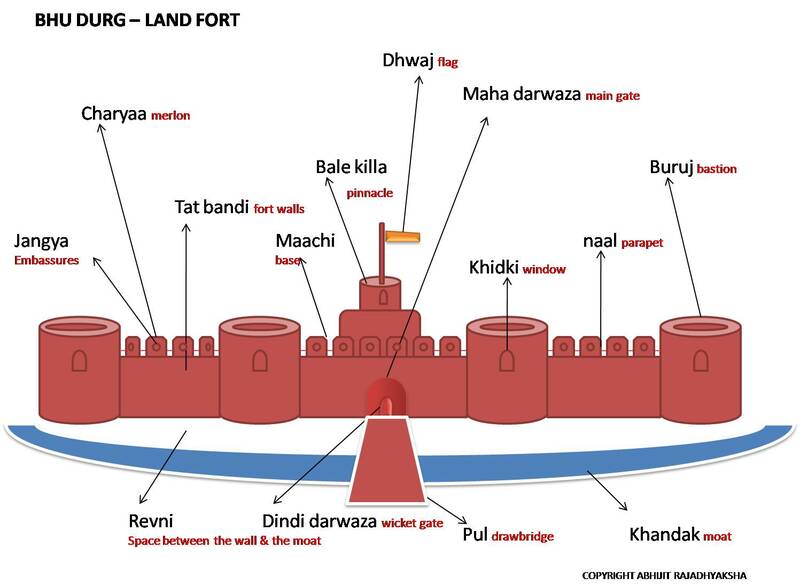 One of the early reference to Forts in the sub continent occurs in the ancient political treatise ‘Arthashastra’ by Kautilya, whereby Kautilya classifies the forts as Jal durg (water forts), Giri durg (mountain forts),Vana durg (forest forts),Dhanu durg(arid/desert forts located in conditions devoid of easy water supply),Mahi durg (brick forts) and Nar durg(human forts). Not to mention the ancient cities in kingdoms like Mathura, Magadha etc were also mentioned being fortified settlements. The social treatise ‘Manusmriti’ by Manu also describes the advantages and disadvantages of different classifications of forts. Maharashtra due to its peculiar topography has always revelled in different forms of fort constructions. Its structures and architectural designs have differed depending upon their region and location viz the plains, the coastal areas, the hilly terrain or the dense forests. The forts in Maharashtra were constructed since the time of some its early ruling dynasties (and their feudatories) like the Satvahanas, the Rashtrakutas, the Kadambas, the Chalukyas ,the Yadavas, the Afghans, the Bahmanis, the Gonds in Berar,the Sultanates of Ahmednagar,Bijapur and Berar, the Siddis, the Europeans (British,Portuguese) and last but not the least the Marathas. 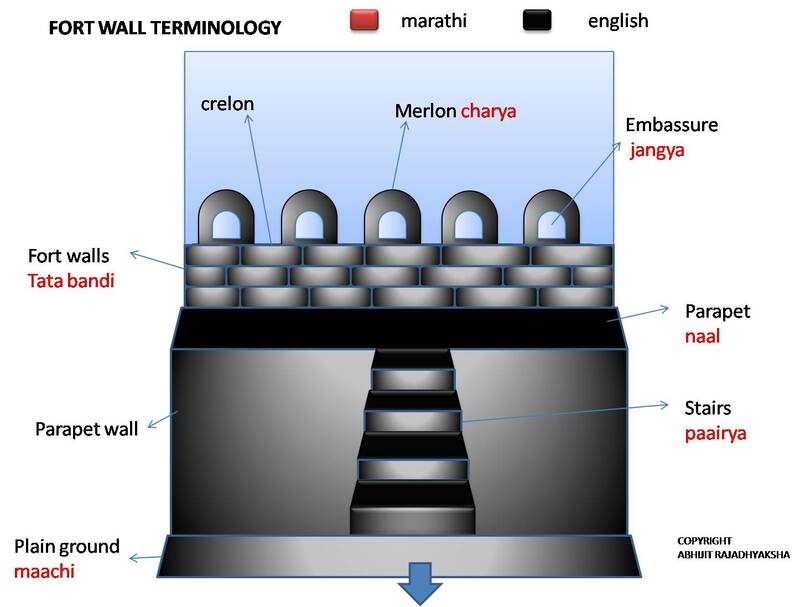 The Marathas gave tremendous importance to Forts as they were their strongest defence against the marauding invaders. 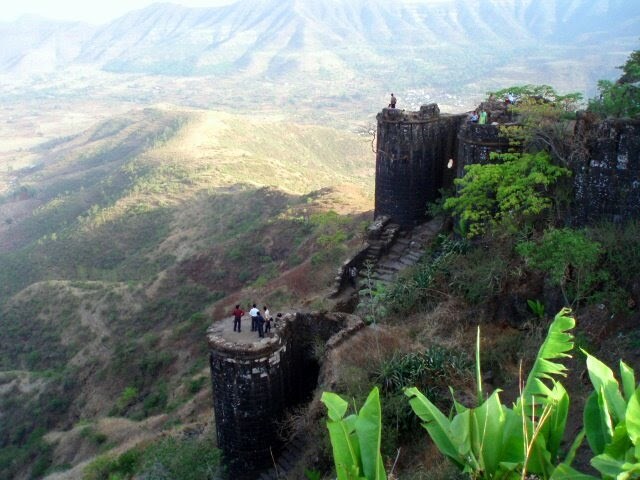 Due to the inherent hilly terrain of the Sahyadri range, most of their forts belonged to the ‘hill’ category. These forts protected the army and the wealth of the kings and housed virtually a village inside the fort. Land Forts: These forts were created on the plains. In Marathi they were called ‘Bhuikot’ (Durg).e.g Chakan fort,Bahadurgad,Solapur fort,Ahmednagar fort etc. Sea Forts: These forts were created in the middle of the sea (at a shallow point with a solid foundation base) and protected by its vicious waves. In Marathi they were called ‘Jal Durg’ . 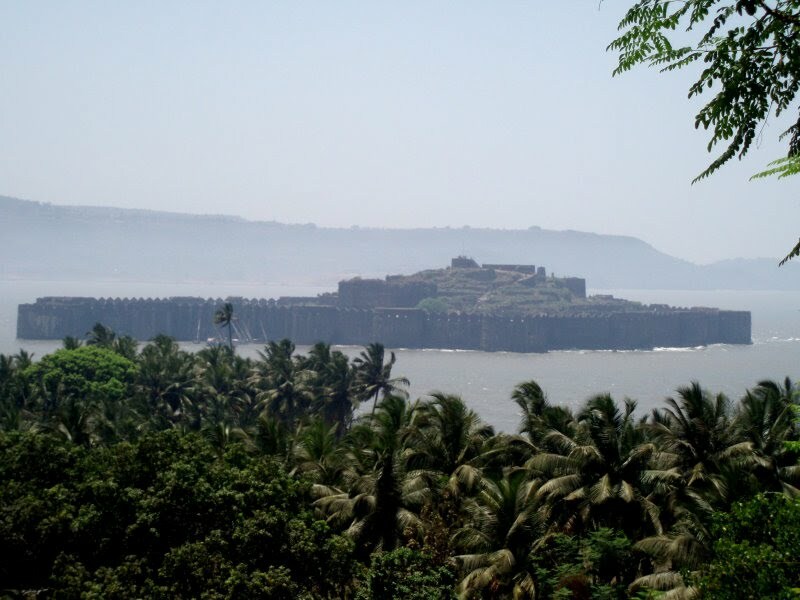 ChShivaji was quick to realise the importance of sea forts. They provided a efficient base for controlling sea traffic and trade. 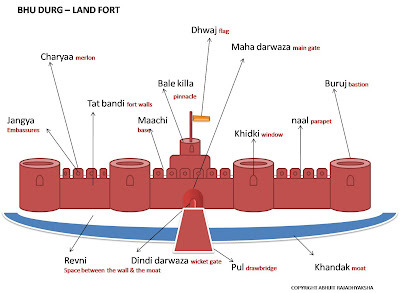 e.g Janjeera (the fort of Janjeera was considered virtually impregnable and was held by the Siddis, enabling them to withstand the most extreme of enemy pressures) , Sindhudurg (built by Ch Shivaji) ,Padmadurg (built by Ch Sambhaji) , Khanderi , Underi etc. Forest Forts: These forts were created amidst a dense jungle, protected by the trees, the reptiles and wild animals. They were the ‘Vana Durg’.e.g Javali. Human forts: human war formations , encampments often resembled forts. These were the ‘Nar durg’. Barring the last which is a type of a field fortification, the rest are all of a permanent nature. Forts in Maharashtra were often a combination of land and sea forts e.g Vijaydurg or mostly hill and forest/land forts e.g Daulatabad etc. The forts in Maharashtra weren’t as picturesque or aesthtic as their northern counterparts but were most practical under the circumstances. The Hill Forts are most common in Maharashtra and scattered all around the Sahyadri mountains. They are located at short distances from each other and were accessed by crossing a couple of mountains. This helped the king and his officials escape from one fort to other in case the earlier fort was captured by the enemy. The Pune district (area 15642 sq kms) itself has around forty forts big and small , while Nasik district (area 15,530 sq km) has approximately fifty five forts. Besides Pune and Nasik there are several forts in Mumbai Thane (mainly built by the Portuguese and the English), Raigad,Marathwada,Southern Maharashtra,Vidharba and Konkan . The hill forts were constructed from stones carved out from the very mountains and joined (as per the design) with the help of lime,rubble,gravel,stones,bricks (used mainly in land forts/smaller forts),molten metal and sand. Lime/mortor was ground on the fort itself (in what were called the 'Chunyaachya ghaani'. Chuna being the term for lime) with the help of a roller passing though a circular channel . The stones formed the outer layer of the fort. Stone layers were often sandwiched between earth,rubble and mortar. At several places the stones appear joint in the male female format devoid of any use of mortor. The stones were joined by mortar. There were even instances of molten metal (lead) used to fill up fissures and strenthen the construction.e.g at Sindhudurg. Together they gave a construction that’s lasted for centuries. ‘Ghera’ or the outermost boundary that encompassed (besides the main fort) the many villages in its vicinity. ‘Chowkis’ or outposts were present near the forts to warn the people within the fort of any impending danger, keep a check on travellers etc. Besides there were ‘Mets’ (smaller outposts on flat areas) midway to the fort, manned by locals and tribals like Kolis,Ramoshis,Maangs who were familiar with the surroundings and could even maintain a vigil at night.e.g Several such mets can still be seen at Sinhagad in Pune. ‘Kada’ or the vertical portion of the fort and the most difficult one to scale. History mentions Tanaji Malusare, a commandent of Shivajis forces climbing the hill fort of Sinhagad from the ‘Donagiri kada’ as the other entrances were heavily guarded. ‘Tat bandi’ or high stone walls of the fort. They comprise of the rampart with a Naal / Faanzhi or running parapet (allowing passageway for minmum one person, generally a sentry), streanthened by the fort walls with the ‘charyaa’ (merlons) and ‘jangyaa’ (embassures) punctuated within them. The semi circular merlons (a crenel between two merlons) gave a cover for the guards and the embassures that pierced through the merlons a view at the enemy on the crowd below. There were even machicolations made and used for pouring hot oil, throwing stones at the attackers from within their apertures.Some fort walls were kept high and one had to climb stairs to access the parapet way alongside them. a contingent of soldiers could be hidden to launch the first attack on a approaching enemy. ‘Buruj’ or Bastions were built joining the fort walls and inadvertently streangthened them. They were semi circular (semi cylindrical etc) extentions of the fort walls that protruded on the outside (unlike the British ones which were square and the Portuguese bastions being pentagonal in shape). They also served as watch towers (tehelnicha buruj) or bases for firing cannons.e.g Naldurg has around 113 bastions. ‘Mahadarwaza’ was the main entrance (gate) of the fort, built large enough for an elephant to pass through. It generally had huge wooden (and metallic) gates with rows and columns of long iron spikes afixed in order to prevent a enemy elephant or a wooden rammer from forcing open the gates e.g the Mahadarwaza or Dilli darwaza at Shanivar wada in Pune. There were often more than two to three entrances one after the other at short distances (e.g Pune darwaza at Sinhagad).Alongside the doors there were spaces called Jibhi where stone plinths available where the sentries rested or kept their belongings. Thousands of stone steps took one onto the mahadarwaza e.g Raigad built at 2851 feet above sea level has around 1500 stone steps leading to the fort. Some ‘Pedhis’ or smaller forts (fortalices) had these nagarkhanas (drum houses also used as administrative offices and watchposts. If attention of the people below the fort was sought, then these nagars/drums were often sounded) built right over the mahadarwaza e.g as seen in the Shanivar wada, the Peshwa's residential citadel in Pune. The walls surrounding the gates usually had mythological figurines of Gandabherund (two headed eagle),Sharabha(half bird,half beast) or those of Hatti (elephant), Vyaal (tigers), Sinha (lion), Sarp (serpents) carved on them (as a part of fort iconography). ‘Dindi darwaza’ or the wicket gate was small enough to let one man pass through and was built within the main gate. It could be opened and shut to let through small human traffic without opening the main gate. 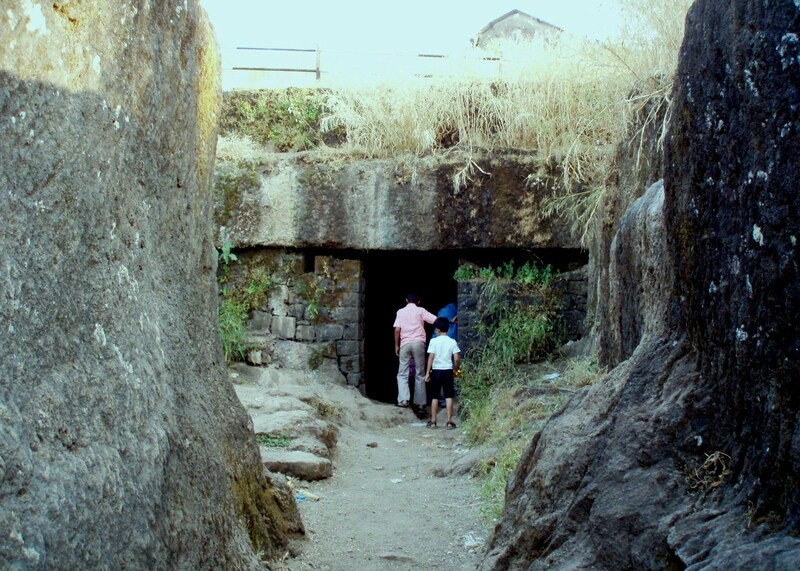 ‘Bhuyaar’ or secret tunnels (from the fort to the safe plains below the fort) provided a escape route to the nobles and their families incase the fort fell to the enemy. ‘Gomukhi dwar rachana’ (cow mouth gate formation) was a special formation of bastions including the ones flanking the main entrance gates . The bastions were often more than one and built in the form of a cows mouth. Hence the name. The pathway had a curvature preventing a direct frontal attack with a rammer or a elephant. The idea was, if the enemy attacks the main gate, then the gate could be defended from the front as well as the rear as the view of the main entrance was also made possible from the adjoining bastion. 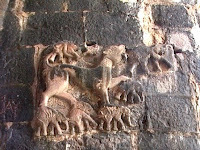 A fine example of the Gomukhi dwar rachana is at fort Raigad. ‘Maachi’ or Upatyika was the vast expanse of plain ground accessed after entry from the gate. Its peripherey was fortified by the stone walls.There used to be residential quarters, administrative offices built on these Maachis. The periphery of this Maachi was always fortified by high walls. e.g Sanjeevani maachi on fort Raigad. ‘Raj sadar’ or the offical quarters of the chief of the fort (or the king) was also the place for discussing important official matters. Ofcourse the tallest building on the fort was the 'Raj mandir' and belonged to the king and served as his residential quarters. Besides the Raj sadar and Raj mandir there used to be the ‘khalbatkhaanaa’ (place for secret/ strategic discussions),’bandigruha’ (prisons), ‘kadeloat’ (steep edges of the fort from where traitors,convicts were pushed down to their death). There were also simple temples,mosques,churches,samadhis,centotaphs,tombs,veergals (hero stones in the memory of the slain warriors),smaller residential quarters, clerical and administrative offices,toilets etc present on the fort. ‘Ambaarkhaana’ was the storehouse for consumables /grainery.e.g Ambarkhana of Panhala fort has three store houses named Ganga,Jamuna and Saraswati. Ganga is the largest one at 35 feet high and covering 10,200 sq feet with a capacity to store 50,000 maunds of grain (1 maund= 40kgs). ‘Toffkhaanaa’ was place to store gun powder. It was a highly guarded and water tight place lest the moisture dampened the gunpowder rendering it ineffective. 'Shastra shala aani taalmichi jaaga ' was the place where arms were kept (in the shastragaar or arms depot) and soldiers practised their martial skills. ‘Ghodyaachya paagaa/ashwa shaalaa’ were the horse stables on the fort (as were also stables for the elephants viz ‘Hattishaala’). ‘Paanyaachya taakyaa’ were the water reservoirs providing water supply for the forts occupants e.g Ganga Jamuna water cisterns at Shivneri fort. ‘Baalekilla’ or Adhityika was the pinnacle point (plain with the highest altitude) of the fort. 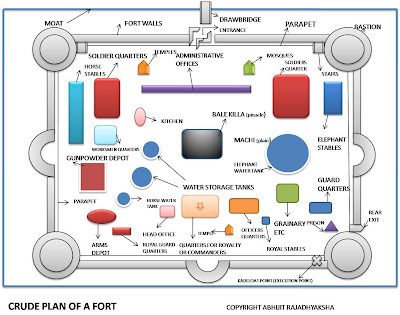 It was fortified so as to be a fort within a fort. In case the enemy did manage to enter the fort, then the Baalekilla became the last point for defence. ‘Khandak’ or Parikha were the Moats were used in land forts. These were deep wide trenches dug around the periphery of the fort, filled either with water, spikes or thorny shrubs (even crocodiles and poisenous reptiles) that provided a defence to the fort from an oblivious enemy. 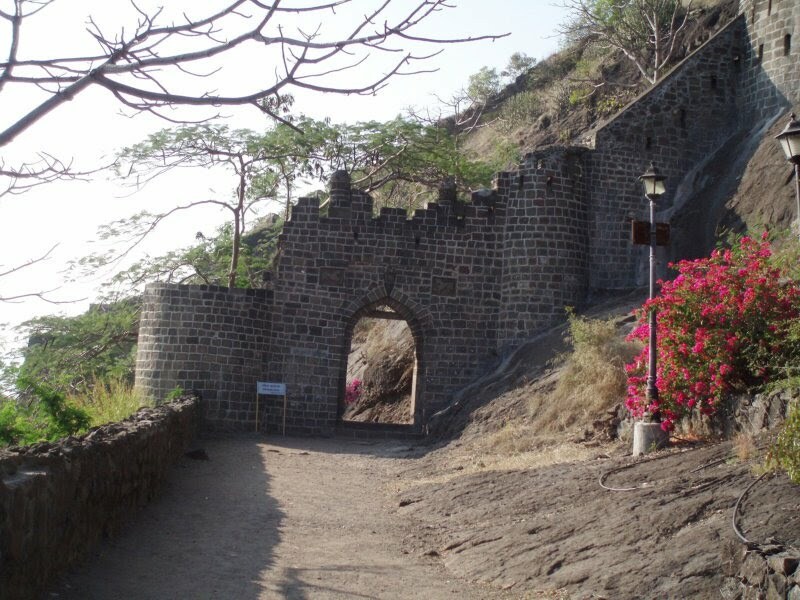 The access to the fort was made possible by a drawbridge that over crossed this trench.e.g Ahmednagar fort has a moat 80 feet wide and 20 feet deep. The space between the fort walls and the moats was called Revni. Chhatrapati Shivaji maharaj the Maratha king clearly understood the importance of forts. He laid more emphasis to the forts than land below and ensured that the forts were always in the possession of the king. Ch.Shivaji ensured more than three to four top officers (besides the killedar or fortkeeper)of different castes viz the Maratha 'Sarnobat' and 'Havaldar'(for guarding the fort), the Brahmin 'Sabnis' (general administration) and the Kayastha 'Karkhanis'(maintaining accounts,treasury) but of equal rank on the fort to keep a watch over each other lest one was corruptted and conspired to hand over the fort to the enemy. Moreover the officers always competed with each other to provide a better administration within his jurisdiction thus improving the overall administration on the fort. The posts were never heridatory (and never for long tenures) and one had to rise in heirarchy. The officials were normally suffled from one fort to the other after approx 5 years. No officers in relation were given charge of forts in proximity of each other. An adequate number of craftsmen like masons, carpenters,cobblers,blacksmiths,tailors etc were also kept on the fort in addition to the soldiers and other officials. There were also a presence of priests, vaidya (practioners of ayurveda , the Indian science of medicne) etc on the fort. The access to the fort was kept as difficult as possible by planting trees shrubs, which even provided a cover for guards or army contingents placed below the fort. If a hill fort had another hill in very close proximity, then another fort would also come up on that hill and both served as twin forts.e.g Purandar gad and Vajragad or Lohagad and Visapur gad etc. Broken bastions, fort walls were immediately repaired without delay. The main gates of the fort were always opened and closed at fixed timings and exceptions were made for none except perhaps the king. A strict vigil was always maintained on and around the fort. Discipline was always paramount and there was no scope for laxation of rules. Ch.Shivaji spent a considerable part of his revenue on the upkeep of his forts. He refortified and streangthened the forts in his control. The king personally supervised his design and construction of forts and often gave several valuable inputs. Some of his notable forts were Pratapgad, Sindhudurg,Vijaydurg etc. In Ch.Shivajis own words, ‘the forts ought to be so impregnable that even if mughal emperor Aurangzeb fights for a year to conquer one fort, then to capture the total three hundred and sixty forts in Maharashtra, it should take him a three sixty years ( which was humanly impossible)’. Refer previous Peshwa articles to get a sense of continuity viz. Peshwas Part 1: Early Peshwas (Sonopant,Shyampant,Moropant,Nilopant,Bahirojipant,Ramchandrapant and Balaji Vishwanath Bhat), Part 2: Glory of the Peshwas (Bajirao I), Part 3: Peak of the Peshwas and Debacle at Panipat(Balaji Bajirao), Part 4: Strife within (Madhavrao, Narayanrao,Raghunathrao,Sawai Madhavrao), Part 5: Decline of the Peshwas (Bajirao II, Amritrao, Nanasahib). The late 18th century marked the decline of the maratha empire. The premature death of Madhavrao Peshwa had left behind a great void in the maratha empire. He was probably the last unifying force amongst the marathas. Stalwarts like Mahadji Shinde, Nana Phadanvis etc did try to sustain the empire , but they were not cohesive enough to provide a unified command to the marathas. Thereafter the empire was wrecked by individual vested interests who were more interested in furthering their own small causes rather than that of the maratha empire as a whole. During this period was born Bajirao II who only proved to be a product of his times. Peshwa Bajirao II (b.1775 in Dhar,M.P , rule: 4 Dec.1796-3 Jun.1818, d.28th Jan 1851) was the eldest son of Raghunathrao Peshwa and Anandibai. During this time his father was at Surat allied with the English. The ailing Peshwa Madhavrao II on his deathbed had named (allegedly) his uncle, Bajirao II, as his heir. Note, earlier Bajirao II had started communication with his cousin and gained his sympathy by using the name of Nana Phadanvis as their common cause of discomfort. It was done through Balwantrao Vamorik whom Nana himself had posted to keep a watch on Bajirao II. But Balwantrao developed a tilt towards Bajirao II. When Nana got the whiff of this, he had Balwantrao arrested. But his old regent Nana Phadnavis was never comfortable with the idea of Bajirao II as the next Peshwa. Nana knew very well that Bajirao resented him and would try his utmost to undermine his authority. Nana therefore convinced Madhavraos widow to adopt a son whom, Nana would then anoint as the next Peshwa, thus continuing to rule as a regent on his behalf. But Bajirao II (who was in prison) had other plans. He wooed over Sardar Baloba Tatya Pagnis, the influential minister of Daulatrao Shinde (anglicized as ‘Scindia’), by promising him Nana's position. In return, Pagnis was to persuade Scindia to throw in his might behind Bajirao II in the race for Peshwa's seat. But Nana got the whiff of Bajirao's clandestine plans and started planning his counter move. Nana knew very well that he could never match Scindia's might. So he thought it would be prudent if he came to an understanding with Bajirao II. Subsequently, Nana had Bajirao released from prison. Thereafter, Nana made a pact with Bajirao whereby Bajirao would be made the next Peshwa and in return Bajirao would allow Nana to continue as the chief minister. Bajirao too agreed with the proposal, as he knew that having the duo of Baloba Pagnis and Scindia around him for too long would also be counterproductive in the long run. He knew the duo would never allow Bajirao to function freely as the Peshwa, so he thought it was best that he for the time being agree to Nana's proposal. Thus Bajirao II was declared the next Peshwa. In return, Bajirao withdrew his original commitment to Sardar Pagnis and declared that Nana would continue as his chief minister. However, Nana was well aware that Baloba Pagnis would never take this lying down and would instigate Scindia to dislodge Bajirao and himself from their posts. Thus before Scindia's forces (led by an disgruntled Baloba Pagnis) could march onto Pune, Nana took refuge in the fort of Purander on the outskirts of Pune. Predictably, Sardar Pagnis urged Daulatrao Scindia to appoint Bajirao II's younger brother Chimnaji Appa as the next Peshwa. The wily Nana Phadanvis who had by now shifted base to Mahad, began secret negotiations directly with Daulatrao Scindia (Nana also sought help from the English,Nizam,Tipu,Nagpukar Bhosales,Holkars,Karveerkars to isolate Scindia and put pressure on him via what is now famously known as Mahad conspiracy). Nana tacitly gave his approval for the appointment of Chimnaji as the next Peshwa, in return for his continuation as the chief minister. Note, initially Nana had wanted to declare Shahu II of Satara as the king and rule as his prime minister. But due to Shahus uncertainties, Nana extended his support to Chimnaji (younger brother of Bajirao II) as the next Peshwa.Chimnaji was thereby adopted by Yashodabai, the widow of Sawai Madhavrao and he was declared the Peshwa and Bajirao II was once again confined to prison. Meanwhile, Sardar Pagnis who would settle for nothing short of replacing Nana Phadanvis, was making plans of seizing Nana. He had already started poisoning Scindias mind against Nana. Nana on his part also never underestimated Pagnis's influence over Scindia. So in anticpation of a possible imprisonment, Nana went underground once again. He renewed his pact with Bajirao to get him released from prison and make him the Peshwa, but both knew this wasnt possible without the approval of Daulatrao Scindia. They knew, they had to wean away Daulatrao Scindia from Pagnis's side and over to their own . They therefore utilised the offices Sardar Sakharam Ghatges (of Kagal) . They persuaded Ghatge to send the marraige proposal of his beautiful daughter Baijabai, to Daulatrao Scindia. In return they promised him a greater say in the affairs of Pune. As per their expectations Daulatrao accepted the marraige proposal. Thus Sakharam Ghatges influence over Daulatrao Scindia increased considerably.This isolated Sardar Pagnis. Note: But Sarjerao Ghatge also became notoriously famous for taking advantage of the situation and looting Pune in 1797. When Bajirao II couldnt cough up the promised sum to Daulatrao Shinde, he let loose his father in law on the happless city of Pune. What followed was a period of absolute cruelty. Ghatge looted Pune with glee abandon. He threatened all of Nana Phadanvis's supporters to not lend him funds or financial support. He extracted lakhs from them and rendered them all financially weak so as not to be in a position to support Nana. Later Daulatrao Scindia captured Nana by deceit in connivance with Peshwa Bajirao II and imprisoned him at Ahmednagar fort. Thus Bajirao II was declared the new Peshwa with Daulatraos support and Nana Phadanvis remained his prime minister. But heart in heart , Bajirao II was never in favour of Nana Phadanvis. He held Nana responsible for his father Raghunathrao's ouster from the Peshwaship. Hence once Bajirao felt himself in control, their old rivalry resurfaced . Bajirao II induced Sardar Sakharam Ghatge to put Nana Phadanvis behind bars and instead promised him Nanas authority. Thus several charges were levelled against Nana and he was imprisoned in the fort of Ahmednagar. But in a matter of time,Bajirao realised that this wasnt such a wise move afterall. He was finding Daulatrao Scindia's (and Sakhatam Ghatge's) behaviour overbearing and beyond his control. This was the time he realised the value of Nana's wise counsel. Thus Bajirao II had his rival Nana Phadanvis released from prison, and reinstated him in his old position albeit with much lesser authority. By now, Nana Phadanvis was a tired man . His days in prison had also taken a toll on his health and he soon died in a couple of years time in 1800, leaving Bajirao II back to his dependency on Daulatrao Scindia. Meanwhile Tukoji Holkar had died at Indore leaving behind two sons Kashirao and Malharrao II and two illegitimate sons Jaswantrao (Yeshwantrao) and Vithoji. Kashirao being the elder was made Tukojis successor, but was challenged by Malharrao. Even the illegitimate brothers Jaswantrao and Vithoji supported the cause of Malharrao .But Kashirao asked Daulatrao Scindia for his help.Daulatrao tried to seize Malharrao in person and in the fight that ensued Malharrao II was killed. His son Khanderao was then taken as a prisoner to Pune. Jaswantrao fled to Nagpur while Vithoji fled to Kolhapur. Vithoji was later captured near Bhamburda and taken to Pune. Jaswantrao meanwhile built a large army and planned an attack on Scindia who had seated himself at Pune (much to the Peshwas dismay as the latter was in his control). Scindia sensing an attack by Jaswantrao , extracted fourty seven lakhs from the Peshwa, marched out from Pune. Both Scindia and Jaswantraos armies clashed, and after a fierce battle Jaswantrao was forced to retreat. Meanwhile Peshwa Bajirao II now feeling free from Daulatrao Scindias stranglehold, now desired to establish his complete control over Pune. He first decided to eliminate those families whom he considered his rivals (like Raste family) or those that were in opposition to his father Raghunathrao (self aggrandisment at the expense of his nobles may have been another motive). The vindictive Bajirao II was merciless with his enemies. Even Vithoji Holkar +(brother of Jaswantrao Holkar) and a friend of Nana Phadanvis ( and someone whom Bajirao believed fancied Amritrao as a Peshwa rather than Bajirao II) , was tied to an elephants leg and dragged through the streets of Pune , till he died . (ref.Kincaid). Jaswantrao Holkar when he heard about his brothers death was furious and swore revenge on the Peshwa . He once again gathered his forces and marched onto Pune. He dodged Scindias forces on the way and made way to Pune. 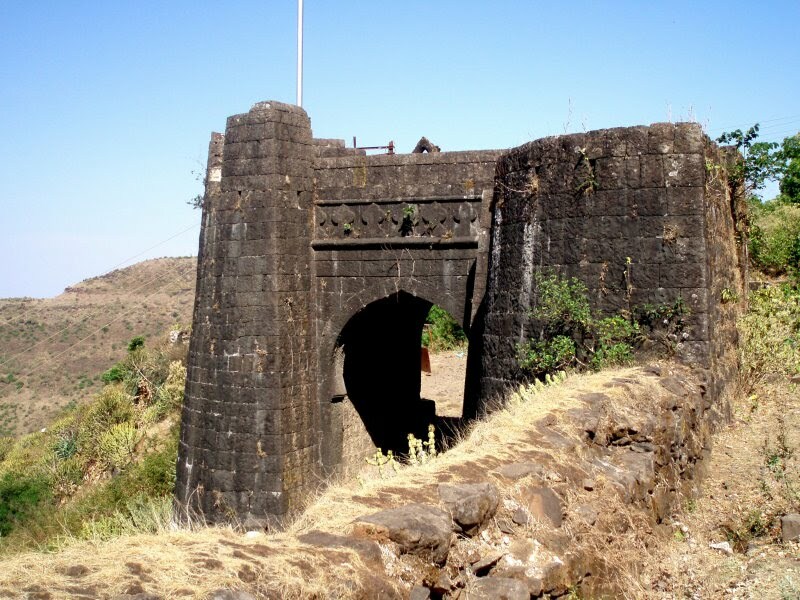 The Peshwa Bajirao II immediately fled Pune and sought refuge on its outskirts at the fort Sinhagad. (Bajirao did not want to seek help from Scindia, as that would be inviting his control over Pune, once again, so he decided to seek help from the English). From Sinhagad, he fled to the Konkan, where he boarded a English ship at Rewandada and sailed to the port town of Bassein (present day Vasai).There he signed a treaty (6th Dec 1802, Treaty of Bassein) with the English seeking their protection against his enemies. Note: Earlier in 1791, the Peshwa Sawai Madhavrao had flirted with the English, when he supported them in their battle against Tipu Sultan of Mysore. For his services the Peshwa had been suitably rewarded with vast lands of Tipu’s territory. Meanwhile Jaswantrao Holkar had sacked Pune and after installing the Peshwas brother Amritrao (as per some reports Amritraos son Vinayakrao) in the place of Bajirao II, he had left for Indore. Note: Amritrao had been adopted by Raghunathrao after the death of his sons in infancy and the next offspring being a daughter. But subsequently Bajirao II was born followed by Chimnaji. The British army accompanying Bajirao II entered Pune. The British army was led by General Arthur Wellesely (brother of , the Governor General) . On the way they were joined by Peshwas aides like Patwardhan,Bapu Ganesh Gokhale,Appa Nipanikar,Patankar and Vinchurkar (grandson of Vithal Shivdev Vinchurkar). Amritrao was pensioned off by the English to Benaras with his family to Varanasi. Bajirao II was once again reinstated as the Peshwa at Pune. (later Karvi in Banda state) with a comfortable princely amount sanctioned by the English. Vinayakrao adopted a son Narayanrao. But later relations soured between the father and his adopted son and another son Madhavrao was adopted. But the family lost a major chunk of their wealth when in 1857 they were suspected by the British of colluding with the mutineers. Scindia did not appreciate Peshwas proximity to the English and nor did Raghuji Bhosale of Nagpur. Rather both resented the the fact that Bajirao had preferred a foreigners help over their own, not to mention decrease in their clout over Pune. They also felt that the English were unnecessarily interfering in what they considered the Maratha affairs . They therefore decided to punish the English and collected an large army to take them on headlong. Scindia was confident of a victory over the English, mainly because of his strong artillery and cavalry cultivated and commanded by a Frenchman called De Boigne. Jaswantrao Holkar who had a disdain for both Scindia and Bajirao stayed neutral. But Daulatrao Scindia soon realized that he had underestimated the English. Scindias army were the first to face defeat (at the battle of Assaye on 21st Sept 1803). Raghuji Bhosale followed next at Argaon in Berar (on 29th Nov 1803, forcing Raghuji to sign the treaty of Devgaon). Scindias army were also defeated by Col.Woodington at Bharuch, Champaner,and by Col Lake at Aligad , Delhi and Laswari . Bundelkhand was reduced by Col Powell. Finally Daulatrao Scindia accepted defeat and on 30th Dec 1803 signed the Treaty of Surji Anjangaon. Scindia ceded all his lands between rivers Jamuna and Ganga and control of his lands in Rajputana. Ahmednagar and Bharuch forts were also given away to the English. The treaty of Surji Anandgaon was supplemented by the treaty of Burhanpur on 27th Feb 1804, whereby Scindia became an ally of the English. Meanwhile successes of the English alarmed Jaswantrao Holkar, who feared for his own possessions. He probably feared that if Scindia allied with the English, then it was possible that they collectively might encroach on his dominions. Jaswantrao Holkar started planning an preemptive attack on the English. He raised an army and attacked the English divisions. But he was isolated against the collective might of the English. General Wellesely and his troops clashed with the forces of Holkar and soon Holkar too was subdued. On 14th Dec 1805,Jaswantrao Holkar too became an ally of the English vide the treaty of Beas. But the treaty weighed heavily on his mind . He tried uniting the Marathas against the British until his premature death by a brain stroke on 20th Oct 1811 at Mandsaur in Madhya Pradesh. He was just thirty five. Note:Jaswantrao Holkar allegedly (as per British historians like Kincaid and Duff ) went insane and had his brother Kashirao and his nephew Khanderao killed.Though some historians mention Khanderao dying of Cholera. Jaswantrao was succeeded by Malharrao Holkar III under the regency of Jaswantraos widow. But the English allegedly plotted her death. Malharrao III and his later wife Bhimabai continued their struggle against the English inspite of a defeat at Mahidpur. Indore was later incorporated by the English as a princely state in the Central India Agency. Bajiraos reign was marked by vindictiveness and perfidy. His entire exercise seemed to be acquiring the estates of his nobles, sometimes over the flimsiest of pretexts. Earlier it had been the estates of Sardar Raste , Nana Phadanvis. It was followed by the estates of the Pant Pratinidhi and Pant Sachiv. Bajirao also unsuccessfully tried to acquire the estates of the Sawantwadi nobles, when the latter were fighting with the Raja of Kolhapur. Bajirao II imprisoned Baburao Phadke the son of gallant warrior Hari Ballal Phadke who had so courageously served the Maratha kingdom.He confined Baburao at Bassein fort where he died.Thereby the Peshwa attached his property. Peshwa even attached some lands of Gaekwads of Baroda over a revenue dispute. The English then intervened and had the Gaekwads send a representative to negotiate matters with the Peshwa. But the Peshwas aide Trimbakji Dengale (as alleged by the English chroniclers) had Gangadhar Shastri, the representative of the Gaekwads, murdered. The English were incensed becaused of this act and arrested Trimbakji. But the man broke free from the Thana prison and gathered a small army around himself. Bajirao too was beginning to dislike the regular interference of the English in his affairs and actively encouraged Trimbakji Dengale. Then the Resident Monstuart Elphinstone, openly asked for the arrest of Trimbakji Dengale and the surrender of forts like Sinhagad,Purander and Raigad. When Bajirao refused, Pune was encircled by the English troops forcing the Peshwa too sign the treaty of Puna on 8th May 1817. Along with the forts the English also forced the Peshwa to give up all the estates of his nobles which he had acquired in these years.Bajirao was even asked to dismantle his forces. Note: To the credit of Bajirao II, he never surrendered Trimbakrao Dengale to the English, though the latter was captured shortly near Khandesh. By now Bajiraos dislike for the English had turned into intense hatred. He soon started building an army for himself under the guidance of his confidante Bapu Gokhale. He also tried to seduce the Indian guards in the English army with emoluments. On 5th Nov 1817, the Peshwas troops and the English troops clashed at what we now know as the battle of Khadki. Peshwa himself retreated to the temple of Parvati at a hill top and watched the entire proceedings of the battle. But seeing his army being routed, the Peshwa fled from battle (earning him the nickname ‘Palputaa’ or the ‘Fleeing one’). Rest of the period was spent running from fort to fort (Satara,Nagpur,Kopargaon,Chanda), pursued furiously by the English forces. Finally on 3rd June 1818, Peshwa Bajirao II surrendered to Col John Malcolm at Mhaw near Indore. The British were careful so as not to humiliate the Peshwa, or imprison or execute him, lest he rebels, or is able to generate sympathy (as in the case of Ch.Sambhaji) which leads to other marathas rallying under a common banner. Col Malcolm himself has outlined the British policy to be followed in India. they preffered to purchase the individual loyalties of each maratha sardar, divide them and thus rule by proxy. The English exiled the Peshwa to the town of Bhramhavarta or Bithur near Kanpur on the banks of the Ganges, which was to be his jagir for retirement. He was sanctioned an princely pension to meet his royal expenses. Bajiraos family Bajirao II had eleven wives, but none could produce an male heir (his only son through his eldest wife Varanasibai had died in his infancy). Therefore on 6th June 1827, Bajirao II adopted a boy, Dhondopant Narayan Bhat, a son of a priest from Venegaon near Bhor ghat. Subsequently he adopted Dhondopants brothers Sadashivarao and Gangadharrao. Dhondopant succeeded Bajirao II as the next Peshwa and came to be known as Nanasaheb. Bajirao's daughter Bayabai was probably the last survivor amongst his children. Death Bajirao II died in 1851 at a ripe age of eighty. Bajirao II remains one of the most controversial Peshwas in Maratha history. Most denounce him as vindictive, cruel, greedy, extremely money minded, myopic and cowardly (known as ‘Palputaa Bajirao’ or the ‘Fleeing Bajirao’), while some term him as a victim of circumstances. Most of Bajirao IIs formative years were spent in prison. Thus his administrative/political education was neglected , perhaps deliberately (but he was said to be keen on outdoor activities like wrestling , malkhamb, knowledge of arms-archery,spear throwing,swordsmanship ref.Grant Duff. Bajirao was also said to be good in the shastras and was a ardent Shivbhakt) and due to the constant hostilities surrounding him, he grew up to be a very suspicious and vengeful person. He never had the chance to hone up the qualities of a good ruler, let alone be a capable general like his forefathers. His personal life was also no different than the princes of those times and quite amorous. His rule has been largely criticised for the prevailing lawlessness, nepotism, casteism and wasteful expenditure in superstitions and rituals. Because of his nature , Bajirao II lost several supporters (his equation with his foster brother was also one of suspicion and they never got along. Bajirao had even imprisoned his younger brother Chimnaji for he feared that someone might use him as a tool to upstage him) and eventually he was isolated and forced with no other option but to seek the help of the English, which paved the way for their rule in the country. In the words of Grant Duff ' No other empire was so foolishly lost '. Nanasahib Peshwa (b.1824) a.k.a Dhundiraj a.k.a Dhondopant, is remembered in the pages of history as the last Peshwa. Nanasahib was the adopted son of Peshwa Bajirao II. Dhondopant was the biological son of an priest, Narayan Bhat and Gangabai. Nanasahib was declared the next Peshwa after the death of Bajirao II. Though Nanasahib outwardly professed loyalty to the English, he always resented their sway over the Maratha dominions. Moreso, he was incensed when he was refused (1853) the title of the Peshwa (he was known simply as the Maharaja of Bitthur) and his entitlement to the pension by the English Governor General Lord Dalhousie. The British also started interfering in the Peshwa's financial and internal matters (On one occassion a property case was filed on the Peshwa indirectly by the British and the womenfolk in the Peshwas household were summoned to the court).This infuriated Nanasaheb to no end. Opportunity to get back at the English came his way, when in 1857 the Indian Sepoy Mutiny broke out in India. Nanasahib collected a fifteen hundred strong contingent, maintaining that it was for the protection of the English lest the rebellion spreads to Kanpur. But on 5th June 1857, he surrounded the 53 Native Infantry division of the British East India Company and declared himself on the side of the mutineers. Note: As per some reports Nanasahib was a reluctant leader and was forced to take charge by the mutineers. Acc. to reports neither was Nanasahib trained militarily nor did he have the basic requisites to be a general. Since the British treasury and arms at Kanpur were in his temporary charge, he was forced by the mutineers to join in the rebellion. Nanasahib then proceeded to loot the treasury.He then came across an contingent of mutineers who were on their way to Delhi. They were soon induced to his cause. He attacked the British entrenchment led by General Wheeler, the next morning. The English held on to the entrenchment till June 26th. Thereafter they surrendered to Nanasahibs army on an assurance that he would give them an safe passage to Allahabad. On 27th June, the English column consisting of soldiers and their families reached the Satichaura Ghat, from where they were to proceed by boat. For reasons unknown some India boatmen jumbed in the waters and started swimming to the banks. In the process some lanterns were knocked off setting some boats ablaze. This led to a lot of confusion. Someone fired the first shot, and soon there was exchange of fire between the mutineers and the English soldiers. Tatya Tope an aide of Nanasahib was leading the mutineers that fired upon the English. Many Englishmen were massacared that day. The women and the children were pulled away and taken prisoners to the Savada House, and later to Bibighar House (under the supervision of a prostitute by the name of Begum Hussaini Khanum), where they were united with the other English imprisoned womenfolk from Fatehgad. Meanwhile a strong English contingent (consisting of Sikh soldiers) led by General Havelock had set out from Allahbad to take on the mutineers at Kanpur and Lucknow. They defeated Nanasahibs army at Fatehgad. They further defeated the army led by Nanasahibs brother Balarao at Aong on 15th July. They were also said to be perpetrating atrocities against the Indian villagers on the way. When this news reached Nanasahibs camp, the mutineers were furious. They wrecked their anger against the hapless women and children at Bibighar. They were mercilessly gunned down (despite Nanasahebs protests). This sordid incident goes down in history as the Bibighar massacare. The English forces soon reached Kanpur and captured the town. Nanasahib and his men escaped to Bithur. The English who by now had gotten to know about the Bibighar massacare went on a rampage, indulging in arson,loot and killing. The English troops later entered Bithur. But found that Nanasahib had escaped from there as well. Nanasahibs general Tatya Tope continued offer a stiff resistance to the English. It is said that Nanasahibs confidantes like Tatya Tope, Rani Laxmibai and Raosaheb (Nanasahibs nephew and close associate) met at Gwalior (June 1858) and declared Nanasahib as their Peshwa and vowed to continue their fight against the English. But Rani Laxmibai met her valorous end at Jhansi .Tatya Tope also led an brave gureilla campaign against the English until his alleged capture and execution at Shivpuri. Note: Tatya Tope (b.1814-d.1859) was the son of Pandurangrao Tope, an courtier of Bajirao II. Tatya was born at Yeola in Maharashtra. He along with Rani Laxmibai of Jhansi were the childhood friends of Nanasahib Peshwe. He became the commander in chief of Nanasahibs forces and led an extensive gureilla campaign against the English forces. His skills in gureilla strategemns were praised even by his enemies.He was captured because of betrayal by a friend and finally executed. Rani Laxmibai a.k.a Manikarnika a.k.a Manu (19 November 1828 – 17 June 1858) was the Queen of Jhansi.She was the daughter of Moropant Tambe an courtier of Peshwa Bajirao II. She married Gangadharrao Newalkar, the Raja of Jhansi. Her son died in his infancy and was soon followed by her husband. She having no son wanted her adopted son Damodar rao to succeed her. But the English wouldn’t allow it.When the English led siege to the Jhansi fort, Rani escaped and she joined the cause of the mutineers in 1858. They captured the fort of Gwalior and carried on its defense with the other rebels. This brave woman preffered to fight the English rather than surrender and met her glorious death in battlefield at Kotah ki Serai,Phoolbagh near Gwalior. General Sir Hugh Rose commented upon her death that the Rani "remarkable for her beauty, cleverness and perseverance" had been "the most dangerous of all the rebel leaders”. Nanasahibs whereabouts were never known. Some reported that he escaped with his family to Nepal and died a fugitive in that country. While some claimed sighting him at Constantinople, while there were also rumours of him having escaped to Tibet. An person resembling Nanasahib was also caught at Gwalior by Maharajah Scindia, but its veracity was never confirmed. A ascetic alleged to have been Nanasaheb was also said to be living in the whereabouts of Sihor, Gujrat. In recent years there were even documents produced by a family living in Gujrat claiming to be the descendents of Nannasaheb.But none of these reports could be substantially confirmed. The last Peshwa of the Marathas seemed to have disappeared in thin air. 2. New Cambridge History of India: The Marathas, 1600-1818 By Stewart Gordon, Cambridge University Press. 3. A History of the Maratha People by G.A.Kincaid and Rao Bahadur D.B.Parasnis (Humphrey Milford Oxford University Press).